Denver, Colorado is a booming city that attracts art lovers, outdoor enthusiasts and anyone fascinated by the Wild West. Rated as one of the fastest growing cities with the most work opportunities, Denver is on many Americans’ lists as a place to visit or settle down. Denver was founded in 1858 as a gold mining town that, with a determination to thrive, grew into a metropolis. If you’re one of the many itching to explore this lively city near the Rocky Mountains, we’ll help you get there. In this post, we’ll share tips for planning a trip to Denver. There’s so much to do and see that it can be hard to narrow your choices, but we’ll look at must-see attractions, iconic restaurants and the best time of year to head to the Mile High City built from dreams of gold. Denver can be a great place to visit any time of the year, and each season offers different festivities and opportunities to explore nature. If you plan on flying to Denver, it’s typically less expensive to fly domestically on Tuesdays, Wednesdays and Saturdays. When searching for plane tickets, try different date combinations to find a price and schedule that works best for you. Denver is a popular city for conventions, so you may want to see what’s going on in Denver before you book your trip. Hotel room rates may go up depending on the Denver convention schedule, and keep in mind how holidays and other events may affect hotel and plane ticket prices. We’ll look at what to expect with each season to help you decide when to go. Most tourists head to Denver in the summer between June and August to enjoy the warm weather. Because this is the most popular time of the year to visit the city, hotel rates are typically higher than in other seasons. It can also get hot, as temperatures sometimes rise above 90 degrees, and you might see a lot of rainfall in July. However, if you don’t want to miss certain summer festivals, like the Denver BBQ Festival or the Colorado Shakespeare Festival, you’ll want to plan your trip for summer. Just make sure to book your reservations far in advance, or at least a month ahead of time. September through October is one of the best times to plan a vacation to Denver. However, it is still a popular time of the year to go. During the fall, the days are sunny and comfortable, with temperatures typically falling between the 40s and 70s in September, and the mid-30s to mid-60s in October. This is the best time of year if you don’t want to miss out on Denver’s beer festivals such as the Great American Beer Festival. Pack layers to prepare for drastic temperature drops at night so you can enjoy a cold one while staying warm. You can find lower hotel rates during the spring, perhaps because of Denver’s rainy spring weather. However, keep in mind that the deals won’t last too long with summer around the corner. If you plan to visit from April to May, you can enjoy attractions with smaller crowds, but you may be limited with what you can do outdoors because of the rain. This might be a good time of year for those who would love to spend their Denver vacation touring the city’s many indoor attractions and museums. Despite spring being the rainiest season, Denver has a dry climate overall and has 300 days of sunshine a year. In the spring, the temperature is usually in the 50s or 60s. Music lovers may want to head to Denver in the spring to dance their days away at music festivals like the Five Points Jazz Festival. Despite Denver being a popular skiing destination, winter is the slowest time of year for tourism, and you can probably find a good deal on hotel rooms in the winter. However, keep in mind that Denver sees an average snowfall of 57 inches a year. On the bright side, the snow usually doesn’t stay on the ground too long. Also, although the temperature may drop into the teens during the winter, it’s not uncommon to experience a warm spring-like day on occasion. So, if you don’t mind bundling up, winter may be a great time to explore Denver. Denver is exactly one mile, or 5,280 feet, above sea level. Its high altitude means beautiful blue sunny skies, as well as greater exposure to the sun. For this reason, when you’re planning your Denver vacation, you’ll want to make sure to pack protection from the sun’s ultraviolet rays, like sunglasses, a wide-brimmed hat, sunscreen and protective lip balm. Summer: The summer heat calls for shorts and light shirts. Bring at least one sweater or jacket because evenings and mornings can be chilly. You might experience sudden downpours, so be prepared by bringing a poncho or raincoat. Winter: Pack lightweight wool or synthetic material clothing that won’t stick to wet skin, and make sure they are insulated. That way you’ll stay dry and warm without having to wear bulky clothing. Pack a few pairs of thermal underwear and dress in layers to protect yourself against cold temperatures. Spring and fall: Bring t-shirts, a rain jacket, a fleece jacket, jeans and shorts to help you feel comfortable in a variety of temperatures. 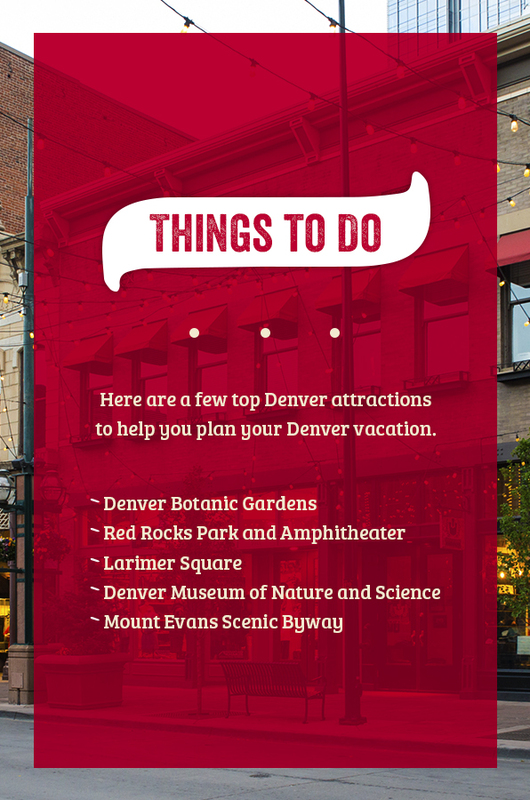 Here are a few top Denver attractions to help you plan your Denver vacation. Although it’s impossible to list all the things you could do during your trip to Denver, we’ve included some must-sees to consider adding to your itinerary. Denver Botanic Gardens, located on York Street, offers 24 acres of plants from all over the world. If you visit the gardens, make sure to check out the Gardens of the West exhibit, which showcases regional landscapes. This exhibit includes a unique variety of plants which can withstand high altitudes and droughts. There are also internationally-inspired garden exhibits, like the Boettcher Memorial Tropical Conservatory which features stunning displays of exotic tropical and subtropical plants, and a variety of ornamental gardens which include colorful classics like roses and irises. You might stroll through the Fragrance Garden to breathe in nature’s sweet perfumes or step back in time while relaxing in the Victorian Secret Garden. You’re welcome to bring food and enjoy a picnic any day of the year. Red Rocks Park and Amphitheater is a one-of-a-kind treasure, made of natural, sound-enhancing sandstones. The amphitheater is a world-famous concert venue and a Denver National Historic Landmark. Dolly Parton, Neil Young and the Beatles are just a few of the artists who’ve performed at Red Rocks. You can check their concert and events schedule, too, if you wish to attend a show during your Denver trip. However, Red Rocks is not just about the music — it’s also a stunning location to take a stroll or get a workout. Here you’ll find a few scenic hiking trails such as the Trading Post Trail and the Geologic Overlook Trail. Take the Trading Post Trail to traverse 1.4 miles past rust-colored rock formations, grassy meadows and picturesque valleys. If you choose to hike the Trading Post Trail, know that the trail is 6,280 feet above sea level which may be difficult for individuals with health conditions. The Geologic Overlook Trail is a short, moderate-level trail in the northwest portion of the park, and the Red Rocks Trail is open for hiking, biking, and horseback riding. Larimer Square is Denver’s beating heart and an excellent place to start your Denver adventure. There’s always something going on in Larimer Square, which occupies the block of Larimer Street between 14th street and 15th street. You’ll find upscale boutiques, western wear, a comedy club, bars and a variety of fine restaurants situated beneath a shimmering canopy of lights. Denver Museum of Nature and Science is a must-see, whether you bring the kids or travel solo. The museum itself has quite a long history, starting back in 1868 with a tiny cabin in Breckenridge and a small collection of Rocky Mountain birds and mammals. Eventually, the collection moved to the city and expanded over time. In 1900 it officially became the Colorado Museum of Natural History and opened to the public in 1908. Now, the museum is renowned as an educational institution and home of many magnificent exhibits. Kids can enjoy playing scientists in the Discovery Zone or learn about the human body through interactive exhibits at Expedition Health. All ages can enjoy viewing the treasures in the Gems and Minerals exhibit or touring the mysterious Egyptian Mummies gallery. There are plenty more exhibits to check out, so set aside enough time to see it all. Would a trip to Denver feel incomplete without a close look at the Rocky Mountains? If so, make sure to a save a day to cruise the Mount Evans Scenic Byway and ride to the top of Mount Evans. The byway is a two-lane road that takes drivers 14,262 feet above sea level once they hit the peak. Along the way, you’ll encounter multiple lookout points for awe-inspiring views of the Rocky Mountains. Also keep your eyes open for mountain goats, bighorn sheep and bristlecone pine trees. Steuben’s is a modern diner with a retro style that serves a range of classic comfort foods, some with unique twists. For example, you can try house-made soda with flavors like blueberry basil or peach honey. What makes Steuben’s stand out is their appetizer called Steubie Snacks which are nuggets of deep-fried pork shoulder coated in powdered sugar. If you prefer more traditional comfort foods, you can also dig into American favorites like macaroni and cheese, pot roast and fried chicken at Steuben’s. In Colorado, green chiles are everywhere, and there’s an ongoing battle between the state and New Mexico over who has the best green chiles. When you visit Denver, there’s no need to worry about the green chile debate. Instead, head to El Taco De Mexico and enjoy the best green chiles in the city. This casual, family-owned restaurant offers authentic Mexican food and is a cherished spot for green chiles. To dine like a local, try a burrito smothered with green chiles, like the Fried Pork Burrito or the Cheeksmeat Burrito. While in Denver, you won’t want to miss eating at the city’s oldest restaurant — the Buckhorn Exchange. Since 1893, the Buckhorn Exchange has been serving up cowboy delicacies, including Rocky Mountain oysters. If you’ve never heard of Denver’s iconic dish, you may be surprised to find out that Rocky Mountain oysters are not saltwater appetizers in a shell. Rocky Mountain oysters are deep-fried bull testicles, so they may not be for everyone. However, if you want the full Denver experience, don’t be afraid to bite the bullet and give Rocky Mountain oysters a shot. The Buckhorn Exchange also features live entertainment four nights a week if you want to celebrate your cowboy spirit. Casa Bonita is a must-see restaurant if you’re bringing the kids or want an unforgettable dining experience with your other half. Casa Bonita is a Mexican restaurant where you can watch cliff divers jump from a 30-foot-high waterfall as you stuff yourself with tacos and enchiladas. It’s entertainment and dining combined in an atmosphere like no other. While guests can enjoy classic Mexican fare, the true attraction of Casa Bonita is its entertainment and elaborate Acapulco-inspired design. Lastly, if you’re craving fresh, flavorful pizza while in Denver, you won’t have to travel far. At Giordano’s, located downtown, you can bite into the famous stuffed pizza that has evolved over 200 years to bring you the tastiest pizza you can find. It began in a small town in Italy where Mama Giordano was known for creating culinary delights, including her famous “Italian Easter Pie.” Reserved for special occasions, this Easter pie featured a bottom crust and a top crust, stuffed with fresh mozzarella and coated with a layer of rich tomato sauce. Mama Giordano’s recipe eventually made it overseas to Chicago when brothers Efren And Joseph opened the first Giordano’s restaurant. You can taste this masterpizza yourself in Denver, and savor the flavors of history. If you’re in the mood for salads, subs or classic Italian dishes, you can find that at Giordano’s as well. Planning a Denver vacation pays off the moment you set your eyes on the Rocky Mountains under the bluest sky you’ve ever seen. With plenty to do, great food to eat and friendly people to meet, you’re bound to be captivated by Denver’s rugged charm. If Giordano’s is on your list of places to eat, plan to bring enormous hunger. We’ll be happy to relieve your hunger pangs with satisfying pizza and mouthwatering Italian dishes. At Giordano’s, we are proud to serve pizza made with the highest quality ingredients, baked fresh until each pie crust is golden and flaky, and the cheese stretches to high elevations. Visit us during your Denver vacation — we can’t wait to offer you a warm, cheesy welcome!